When playing other sports like baseball, football, or basketball, we are taught to stick our tailbone out to get into a “ready” position. This is a common misunderstanding of an athletic setup position which can negatively affect your golf swing. 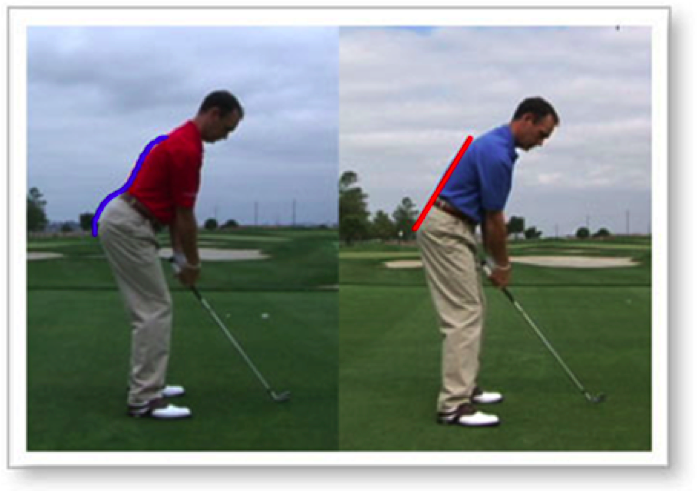 Golfers that stick their tail bone out too much at address are in what is termed “S” Posture. “S” Posture is caused by an excessive arch in your lower back, otherwise known as an excessive lordosis. When your back is arched in this position it causes your abdominals and glutes to turn off and causes added stress in the muscles of your lower back which can cause pain. Do I have “S” Posture? Look at yourself in the down the line view either by looking at a mirror or with a video camera. What you should see is a nice flat line from your tailbone to the base of your neck. If there is a space between the line and your lower back then you are in “S” Posture. Mobility of the joints around your lower back and hips along with coordination of muscles in these areas are often the cause of this problem.